U.S. Secretary of State John Kerry has kicked off his first official overseas trip by meeting with British leaders in London on the first leg of a hectic nine-day dash through Europe and the Middle East. 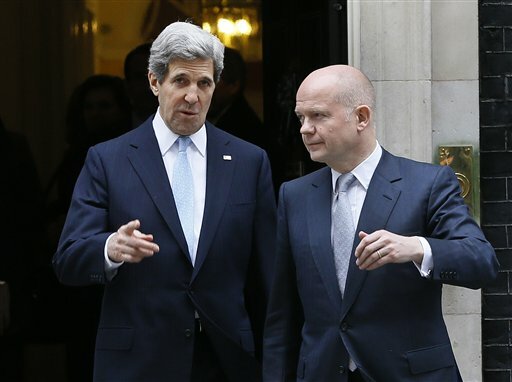 Kerry’s maiden diplomatic meeting abroad was on Monday with British Prime Minister David Cameron for talks expected to focus on the crisis in Syria and Iran’s nuclear program. Later, he will see Foreign Secretary William Hague before flying to Germany for meetings in Berlin. Kerry arrived on London late Sunday as the Obama administration launched a frantic effort to try to salvage a Syrian opposition conference that Kerry plans to attend this week in Rome. Some members of the sharply divided Syrian Opposition Council are threatening to boycott the meeting.